I've been adopted as bunny wife for Buzz, also adopted from SaveABunny. We love each other very much, and he's a big fan of my dance moves! UPDATE: Roadie just came back to SaveABunny from a foster home that loved her, but was unable to adopt her. She's still settling in and we know she's missing the love of a dedicated family. New photos coming soon, since she has grown up since this photo was taken a few months ago. No worries, though since she is still adorable! Roadie is potentially e.cunniculi positive, but shows no symptoms. Roadie is absolutely adorable. She's cute as can be with her funky Dutch/lionhead looks and perfect mix of feistiness and sweetness. She's very little and also still very young-just a teenager. 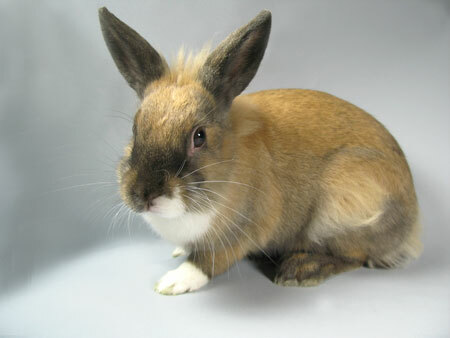 She arrived at SaveABunny as a medical rescue from the San Francisco shelter. She had been adopted and returned because of abnormalities in a urine culture. It could be infection or it could be kidney problems. We don't yet know and she will go in for more tests. She acts perfectly normal---eating, drinking, playing , pooping and all the stuff a normal rabbit does, so we are hoping for the best. As soon as we find out more about her health we will update you on her adoption and spay status. Her medical tests are expected to cost about $300. Donations to help us cover these expenses are urgently needed and greatly appreciated!